OP3293. 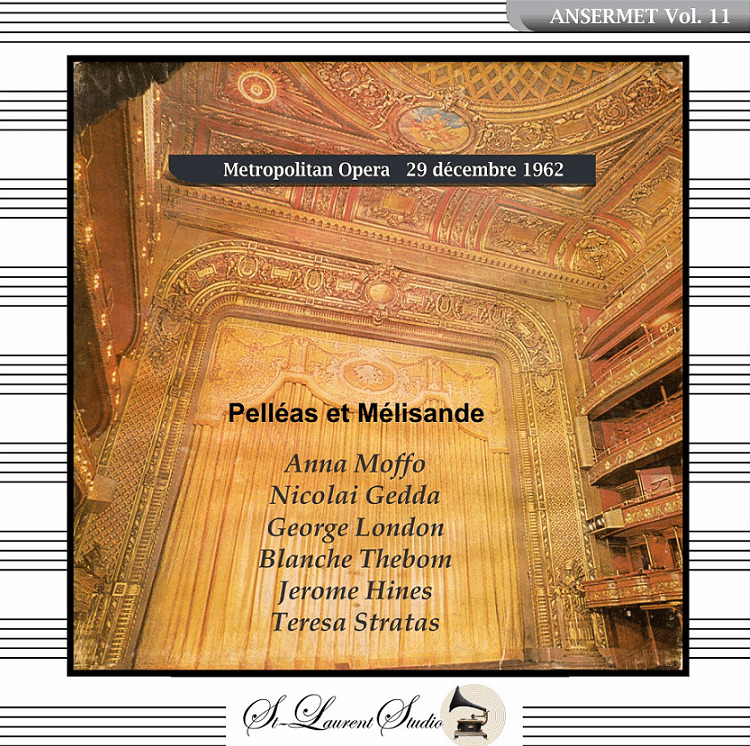 PELLÉAS ET MÉLISANDE, Live Performance, 29 December 1962, w.Ernest Ansermet Cond. Met Opera Ensemble; Nicolai Gedda, Anna Moffo, George London, Jerome Hines, Blanche Thebom, Teresa Stratas, Clifford Harvuot & William Walker. [The final of Ansermet's mere five performances at the Met] (Canada) 3-St Laurent Studio YSL T-794. "Among opera lovers, PELLÉAS ET MÉLISANDE is a notorious case of 'meat or poison'. Many resent the lack of vocal bravura and of catchy tunes to whistle on the way home from the theatre. But for those that succumb to its quasi-narcotic allure, any recorded performance that sheds fresh light on Debussy's elusive masterpiece, is to be warmly welcomed. The Metropolitan Opera has a distinguished tradition of presenting performances of PELLÉAS with the world's greatest singers. Previously issued broadcasts include a dimly recorded but fascinating performance dating from 1934 with the virginal Mélisande of Lucrezia Bori, the Pelléas of the Canadian tenor Edward Johnson and the unexpectedly convincing Golaud of the great Italian bass Ezio Pinza. This was followed in 1945 with another distinguished but largely unidiomatic cast. The Brazilian soprano Bidu Sayao with her little cries and sobs sounds like she has strayed off the set of Massenet's MANON, and the fine bass Alexander Kipnis as though he has come in from PARSIFAL. In 1960 it was the turn of another non-francophone cast including Victoria de los Angeles, Theodor Uppman and George London conducted by Jean Morel. In this performance dating from 1962, authenticity is guaranteed in the orchestra pit by the conducting of Ernest Ansermet for whom Debussy's opera had been a life-long passion. Ansermet recorded the opera twice commercially and was planning a third recording when he died in 1969. George London's black-voiced and virile Golaud is familiar both from Ansermet's second recording and from the 1960 Met broadcast . The chief interest in this performance therefore lies in the unconventional casting of the title roles. Debussy conceived the role of Pelléas for a 'baritone Martin' - a high-lying light baritone. Above all he wished to avoid the cliché of the swaggering, crowd-pleasing tenor. The tessitura lies between tenor and baritone and can be sung by either, though not necessarily with ease. Over the years a number of tenors have sung the role, including David Devriès and Fernand Francell in the Salle Favart where it had been premiered with the baritone Jean Périer. Other tenors who have succeeded in the role include Ernst Haefliger and George Shirley. 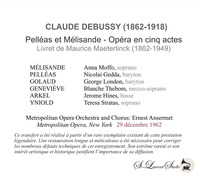 The slancio with which Nicolai Gedda attacks the alternative high 'A' in the phrase 'Ils m'aiment plus que toi' in Act III offers precisely the kind of operatic thrill that Debussy was apparently keen to avoid. Purists might object to Gedda's tenorial ardour in the pastel shades of Debussy's delicate score, but it would have to be a very resolute 'Pelléaste' who could resist the sheer beauty of his singing. Indeed this might also be just the performance to break down the prejudices of those who resist the charms of Debussy's score. Anna Moffo's vibrant and luscious tone is also far from what one expects in the role of Mélisande. In 1961 Moffo was just into the third year of her glorious career at the Met and at the very height of her powers. The young Italian-American soprano seemed to be endowed with every gift that nature had to offer - a lovely voice that was at once warm and fresh in timbre, breathtaking physical beauty, intelligence and musicality. She was a singer we associate more with the flesh and blood heroines of Verdi and Puccini, and indeed her Mélisande is more corporeal and passionate and less fey than most. It is a performance that makes it clear that there is more than one way to interpret the highly ambiguous role of Mélisande. Blanche Thebom and Jerome Hines present an imposing pair as Geneviève and Arkel, with big voices and good clear diction, though Thebom sounds by this stage as if she may have sung a few too many Brangaenes. The very young Teresa Stratas at the beginning of her career, singing the role of Yniold sounds like a Mélisande in waiting." 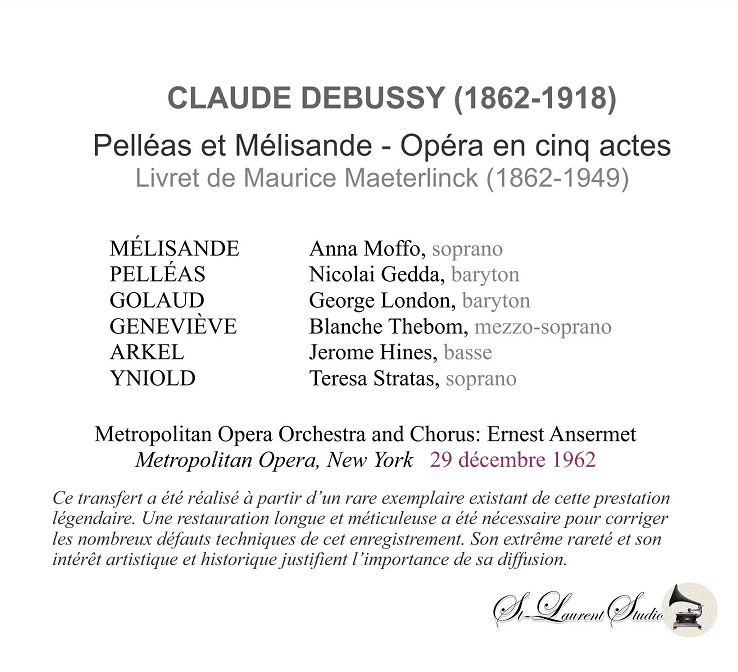 “Performances of Claude Debussy’s only opera PELLÉAS ET MÉLISANDE at the Metropolitan Opera have been almost as elusive as the frail, mysterious Mélisande herself. Since its first Met performance on 21 March 1925, just a mere 23 years after its world premiere, the opera has been performed only 114 times to date - a total of 93 years. Interestingly, the work was immensely popular in New York from its first performance on 19 February 1908, barely six years after its world premiere at the Opéra-Comique on 30 April 1902. It was presented by the only company to give the Metropolitan Opera its only real competition during this time, the Manhattan Opera Company, run by Oscar Hammerstein l. Where Met General Manager Giulio Gatti-Casazza was able to offer the public truly grand opera with some of the greatest singers of the time (Farrar, Sembrich, Homer, Caruso, Scotti, and Chaliapin, to name just a very few), Hammerstein and the Manhattan Opera Company drew its audiences with its own pool of great singers, but more significantly, somewhat more adventurous repertory, particularly with the French works that the Met was not programming, PELLÉAS ET MÉLISANDE, LOUISE and the many operas of Jules Massenet, among them. No doubt, one of the reasons for the success of these early New York performances of PELLÉAS ET MÉLISANDE was the presence of the Mélisande of the world premiere, Mary Garden. It should also be noted that Hammerstein was able to secure the services of the first Pelléas, Jean Périer, Golaud, Hector Dufranne and Geneviève, Jeanne Gerville-Réache, as well for these initial performances. When the work finally arrived at the Met in 1925, it had its own star-studded cast, including Lucrezia Bori (wearing costumes specifically designed for her by the great Russian artist, Erté), Edward Johnson (who studied the role with the role’s originator, Jean Périer and who would eventually become General Manager of the Met in 1935), Clarence Whitehill, Léon Rothier and Kathleen Howard. Louis Hasselmans conducted. The opera was performed 32 times in 11 consecutive seasons and has been in and out of the repertory sporadically ever since. The 29 December 1962 broadcast presented here was only the sixth Met broadcast of the opera and features an equally illustrious cast in the presence of Anna Moffo, Nicolai Gedda, George London, Jerome Hines, Blanche Thebom and a young Teresa Stratas who would herself become one of the great Mélisandes of our generation. In the pit was the eminent Swiss maestro, Ernest Ansermet, in what was to be his only season at the Met and this, in fact, is his last performance with the company and his only Met broadcast. This broadcast also provides us with the only opportunity to hear Moffo and Gedda as the protagonists and Thebom as Geneviève. The next time we hear Stratas in the opera it will be as Mélisande. Another interesting aspect of this broadcast is that Ansermet opens a small cut in Act Four thereby allowing us to hear for the first time on a broadcast of the opera a short scene for Yniold. After this broadcast, it would be a little over nine years before the radio audience would hear the opera again. In THE NEW YORK TIMES review published on 1 December 1962 of the first performance of the run (which featured Theodor Uppman as Pelléas; Gedda would take over at the third of the five performances that season), Harold C. Schoenberg concluded his review with these words: ‘On the whole, then, a fine performance of the exquisite, gossamer tonal world that makes up PELLÉAS ET MÉLISANDE. With Mr. Ansermet holding it together with such suppleness, and with so reliable a cast, the opera could not help but make an impact. ‘Impact’ might not be the right word, PELLÉAS ET MÉLISANDE being the crepuscular thing it is, but for several hours last night at the Metropolitan Opera was the realm of a magic, subdued, dim-lit empire’. Turning down an offer to go to Hollywood, Moffo studied at the Curtis School of Music in Philadelphia. After winning a Fulbright Scholarship in 1954, she travelled to Italy to study and quickly established herself through appearances on RAI Television. She returned to the United States and made her American debut at the Lyric Opera of Chicago in 1957. She made her Met debut on 14 November 1959 in what was her most famous role, Violetta in LA TRAVIATA, which she sang 80 times during her Met career. Her full lyric soprano voice and easy vocal agility allowed her to encompass a wide variety of 21 different roles during her 17 years with the company. These were her only performances of Mélisande at the Met. Our Pelléas, Swedish tenor Nicolai Gedda, was one of the most versatile tenors of our generation. His superlative linguistic abilities allowed him to sing in at least seven different languages. In addition to his beautiful, evenly produced voice, with its easy upper extension, he possessed flawless legato and diction. With a career spanning over an astonishing 50 years, Gedda sang 367 performances of 28 operas during his 25 seasons at the Met, including the World Premiere of Barber’s VANESSA in 1958 and the United States Premiere of Menotti’s THE LAST SAVAGE in 1964. In 1972, he sang Gherman in the first-ever Met performances of OIQUE DAME in its original language, the first time a Russian opera was performed in the vernacular. His repertory ranged from the classical operas of Gluck and Mozart to the bel canto works of Donizetti and Bellini, as well as Verdi, Puccini, Strauss (Johann and Richard) and Smetana and he excelled in the French repertory of Gounod, Bizet, Offenbach, Massenet and Debussy, as we can hear on this broadcast. Like Anna Moffo, these were his only performances of the opera at the Met. Golaud is portrayed by the great singing actor bass-baritone George London. Born in Montréal, Canada, London was only 25 when called upon by conductor Antal Doráti to make his professional debut. Within a few years he was engaged by the Vienna State Opera and his career was established. Famous for his Wagnerian roles, he was chosen to sing Amfortas in the first post-war production of PARSIFAL at the Bayreuth Festival in 1951. Later that year, on 13 November, he made his Metropolitan Opera debut as Amonasro in a New Production of AÏDA on Opening Night of the 1951-52 Season. One of the highlights of his career was the honor of becoming the first North American artist to sing the title role of BORIS GODUNOV at the Bolshoi Opera during the Cold War in 1960. Despite being diagnosed with a paralyzed vocal cord in the early 1960s that brought his career to an early end, London still performed over 250 times in 18 different operas during his 15 seasons with the Met. During this time, he sang in two United States premieres: ARABELLA in 1955 and THE LAST SAVAGE in 1964. Mezzo-Soprano Blanche Thebom, our Geneviève, is perhaps best remembered for performance of Brangäne in the now-historic first complete studio recording of Wagner’s TRISTAN UND ISOLDE staring Kirsten Flagstad and conducted by Wilhelm Furtwängler released by EMI in 1952. It was also the role of her Metropolitan Opera debut on 28 November 1944. While particularly well-known for her roles in the Wagnerian repertory, it was the role of Amneris in AÏDA which she performed 80 times between 1946 and 1959, that she would sing more than any other during her 23-year Met career. She took part in two Met premieres, THE RAKE’S PROGRESS in 1953 and ARABELLA in 1955. Her final performance at the Met was as the Countess in PIQUE DAME during the first season at the New Metropolitan Opera House at Lincoln Center in 1967. Our Yniold, Canadian soprano Teresa Stratas was only 21 years old when she made her Met debut on 28 October 1959 as Pousette in MANON after winning the Metropolitan Opera National Council Auditions earlier that year. Her Met career spanned 35 years during which time she performed 385 times in 39 roles in 35 operas. Like her colleagues on this broadcast, Nicolai Gedda and George London, she also sang in the United States Premiere of THE LAST SAVAGE in 1964 as well as performing the title role in what was arguably her greatest triumph, LULU, in the Met Premiere of the complete three act version of the opera. Known for her intensely dramatic portrayals of some of the most complex operatic characters, she created the role of Marie Antoinette in the World Premiere of John Corigliano’s THE GHOSTS OF VERSAILLES in 1991. As luck would have it, her final Met performance was a broadcast in which she sang Jenny in Kurt Weill’s THE RISE AND FALL OF THE CITY OF MAHAGONNY on 9 December 1995. As impressive as all of the above statistics are, it is our Arkel, California-born bass Jerome Hines, who boasts the record number of performances among his colleagues in this broadcast: 869 performances in 45 roles in 39 operas over the course of his 41 seasons with the Met. His debut took place on 21 November 1946 as The Officer in BORIS GODUNOV, an opera that he would perform no less than three different roles in during his career at the Met. He added Pimen in 1953 and the title role in 1954, becoming the first US-born singer to perform the role with the company. He performed in three Met premieres (PETER GRIMES in 1948, KHOVANSHCHINA in 1950 and MACBETH in 1959) and was chosen to sing the role of the Grand Inquisitor in DON CARLO for the Opening Night of Rudolf Bing’s first season as General Manager of the Met in 1950. He performed the role of Arkel 22 times during his Met career between 1953 and 1983. His final performance was as Sparafucile in RIGOLETTO on 24 January 1987. A deeply religious man, he composed an opera based on the life of Jesus entitled I AM THE WAY, which premiered in New York City in 1956, with Hines himself in the title role.